In honor of Halloween, which is in only 5 days, I’ve decided to make a short list of Beatles songs that, for whatever reason, creep me out or used to scare me. This won’t be as long a list as my usual lists, for the simple reason that there are not too many Beatles songs that make me scared! 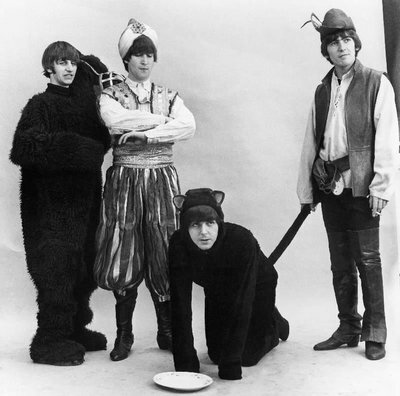 But, though they were originally the lovable moptops, the Beatles also had a dark side. So, without further ado, here is my list of scary Beatles songs! Upon a casual listen, this song is pretty unassuming, but when you actually listen to the lyrics, it’s really creepy. Apparently the Beatles stole the first line, “I’d rather see you dead little girl than to be with another man” from an Elvis song called “Baby, Let’s Play House”, and they built the rest of the song around that. It’s basically about a man threatening to kill his girlfriend if she cheats on him. This song has never really scared me, but the lyrics are quite ominous, which makes it a good choice for this list! Back before I became a devoted Beatles fan who would listen to anything they recorded, I used to not be able to listen to this song all the way through because it scared me too much. I can’t put my finger on why it scared me, but it just did. For whatever reason, I just could not get through it without pausing the song and listening to something else. Of course, I got over this fear a while ago, and rocking out to Helter Skelter at the Paul McCartney concert was one of my highlights of the night! Still, the fact that this song supposedly inspired the Manson murders makes it scary to me. This is another song that I’ve grown to love and appreciate, but that for some reason used to scare the wits out of me. I think it was the orchestral links between the Lennon and McCartney sections of the song that scared me, and whenever I listened to that part of the song, I felt like a car was about to hit me. For some reason, I could not find the original album version of this on Youtube, but I did find a version performed live by The Fab Faux, so hopefully you get the gist of this song through their performance. Whenever I listen to Abbey Road, I almost dread this song coming on, because it’s so long and demonic sounding that by the end, I’m always completely freaked out and silently willing it to be over so my heart can stop racing. The last few minutes of this song are entirely instrumental, and the “whooshing” sounds near the end sound like a plane about to crash. In other words, this is a pretty creepy song. Don’t listen to it if you fear the end of the world is upon us. This is by far the scariest Beatles “song” (I don’t really consider it a song) in existence, but it’s more than that. It’s quite possibly the weirdest, freakiest, creepiest 8 minutes ever recorded in the history of rock. This song creeps everybody out, including me, which is why this is the only Beatles song to date that I have only listened to once all the way through. I hate skipping songs on albums, but whenever I listen to the White Album, I just can’t bring myself to listen to this song. It’s too trippy and too scary for me to handle. This is probably a common choice for “scariest Beatles song,” but rightfully so, because it’s just insane. I love the Beatles, but this takes it a bit too far into the psychedelic territory for me to enjoy and appreciate. And that completes my list! I hope you have a wonderful weekend, and a happy early Halloween! I’m also VERY excited for the Fab Faux George Harrison tribute concert that my dad and I are seeing tonight! I will surely be posting about it tomorrow, so be on the lookout!